AirAsia stewardesses and performers from STB hold a model of an AirAsia plane. Lee (second right) presents a souvenir in the form of the Kuching-Langkawi flight route to Abdul Karim while Wahab (second left) and AirAsia staff look on. 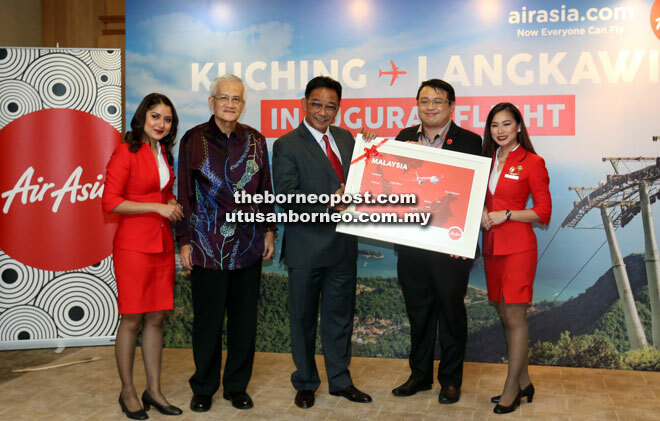 KUCHING: AirAsia, the world’s best low-cost airline, yesterday launched its inaugural flight from Kuching to Langkawi which will operate four times weekly on Monday, Wednesday, Friday and Sunday. The launching ceremony at Kuching International Airport (KIA), using flight AK5093, was ‘sent off’ by Minister of Tourism, Arts, Culture, Youth and Sports Datuk Abdul Karim Rahman Hamzah, Sarawak Tourism Board (STB) chairman Datuk Abdul Wahab Aziz and AirAsia Head of Commercial Spencer Lee. Celebratory all-in-fares from RM100 one way are available for booking online at airasia.com from now until Aug 13 for travel period between now and Feb 8 next year. With the inaugural flight, AirAsia now flies to 11 destinations from Kuching with more than 220 weekly one-way flights. The other destinations are Miri, Sibu, Bintulu, Kota Kinabalu, Johor Bahru, Kota Bahru, Penang, Kuala Lumpur, Singapore and Pontianak. “We (AirAsia) are committed to continue growing this hub as Sarawak has a lot to offer beyond a tourism destination. “Last year, we have flown about 3.2 million guests in and out of Kuching hub and we believe that the introduction of the two new routes to and from Kuching, namely Pontianak recently and Langkawi today (yesterday), echoes our commitment in Sarawak,” Lee said. He thanked the state government for the continuous support and guidance and looked forward to strengthening Kuching hub with further connectivity in the future. Lee believed the time was right for the airline to have the Kuching- Langkawi route, as well as having a strengthened partnership with the state government and STB. “We are very focused on improving this route and keeping it, but we alone cannot provide the air connectivity. So we need a close partnership from the tourism sector including hotels to assist us,” Lee said, while expressing confidence that the route would grow. He also said that AirAsia together with STB would carry out an aggressive promotion in Pontianak at the end of the year to position Kuching and the state in general as the key medical and education hub in the region. He said arrivals from Pontianak were now about 75 per cent on average, with room for improvement. He hoped that by year end, the flight would reach 85 per cent load, adding that the airline could add more flights if it could reach 90 per cent. Asked on the future plan for the state, Lee said: “We are still at the planning and discussion stage to add an international route at the end of the year because it is our dream to grow in Kuching and Sarawak. “For that, AirAsia will have a trade fair in Sibu this weekend. “Last year we had it (trade fair) in Kuching and this year in Sibu. This is our commitment to Sarawak,” he added.